1. ELIGIBILITY: Promotion is open only to legal residents of Canada who have reached the age of majority in their province or territory of residence at the time of entry, excluding residents of the province of Quebec. Void where prohibited. Promotion is subject to all applicable federal, provincial, territorial, municipal, and local laws and regulations. All employees or agents of the Sponsor, Taste of Nature and their respective parents, affiliates, subsidiaries and agents (collectively the "Taste of Nature Parties"), and any entity involved in the production, implementation, promotion, administration or fulfillment of the Promotion, and the individuals living in the same households of each of the above are ineligible to participate in the Promotion. 2. SPONSOR: The “Sponsor” is: Taste of Nature, 230 Ferrier St Markham, ON L3R 2Z5. The “Administrator” is: The BrainStorm Group, 191 Niagara St Toronto, ON M5V 1C9. 3. AGREEMENT TO OFFICIAL RULES: By participating in the Promotion, each entrant fully and unconditionally agrees to and accepts these Official Rules and the decisions of the Sponsor, which are final and binding in all matters related to the Promotion. 4. PROMOTION PERIOD: "Win A Taste of Nature” (the "Promotion") begins at 12:00:01am Eastern Standard Time ("ET") on August 19, 2011 and ends at 11:59:59pm ET on December 31, 2011 (the "Promotion Period"). All entries must be received during the Promotion Period. The Sponsor's computer is the official time keeping device for this Contest. 5. HOW TO ENTER: Submit your completed entry form during the Promotion Period, ending December 31, 2011. 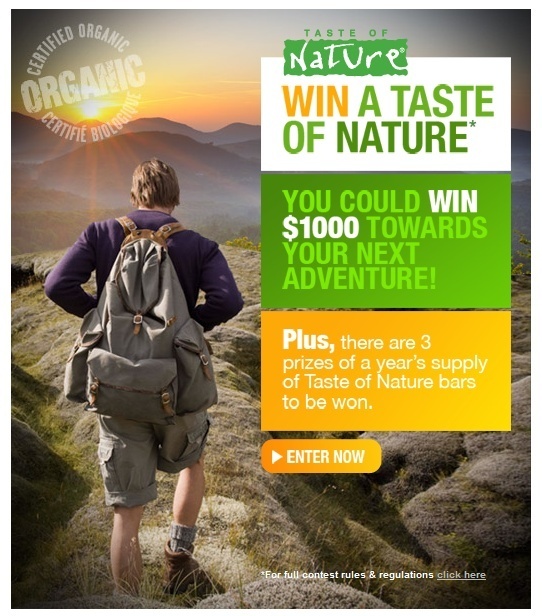 Entrants can enter online via www.facebook.com/tasteofnature or through an offline ballot obtained from an official Taste of Nature Representative. Limit one (1) entry per entrant per 24-hour period during the Promotion Period. Each entrant will have the ability to receive additional entries per 24-hour period during the Promotion period through sharing the contest via Facebook’s ‘Share with a Friend’ option. Any attempt by an entrant to acquire more than one (1) entry per 24-hour period during the Promotion Period by using numerous email registrations, identities, or any other methods will void that entrant's entries and that entrant may be disqualified. Valid entries must contain all information requested. Incomplete and/or multiple entries will be disqualified. The Sponsor will not verify receipt of entries. By entering, entrants acknowledge compliance with the Official Rules, including eligibility requirements. Responsibility for receipt of entry rests solely with the entrant. Multiple entrants are not permitted to share the same email address. Any attempt by any entrant to obtain more than the permitted number of entries by using multiple/different email addresses, identities, registrations and logins, or any other methods, including without limitation, the use of any computer software, mechanical or other device to increase the number of entries submitted, will void that entrant’s entries and that entrant may be disqualified. Use of any automated system to submit entries is prohibited and will result in disqualification. Sponsor is not responsible for lost, late, incomplete,invalid, unintelligible or misdirected registrations, which will be disqualified. In the event of a dispute as to any online entry, the authorized account holder of the email address used to enter will be deemed to be the entrant. The "Authorized Account Holder" is the natural person assigned an email address by an Internet access provider, online service provider or other organization responsible for assigning email addresses for the domain associated with the submitted address. Potential winners may be required to show proof of being the Authorized Account Holder. 6. PRIZE DRAWING: Administrator is an independent judging organization whose responsibilities are the administration and operation of the Promotion. The selection of potential winners is final and binding. The random drawing will be conducted on the Sponsor's behalf by the Administrator at approximately 12:00 p.m. ET on or around 31 December 2011. 7. POTENTIAL WINNERS: All potential winners are subject to verification by Sponsor or Administrator, whose decisions are final. An entrant is not a winner of any prize, even if the PROMOTION SHOULD so indicate, unless and until entrant’s eligibility and the potential Winning ENTRY has been verified and entrant has been notified that verification is complete. Sponsor will not accept other evidence of winning in lieu of its validation process. 8. VERIFICATION OF POTENTIAL WINNERS: All selected potential winners must continue to comply with the terms and conditions of these Official Rules. Winning is contingent upon fulfilling all requirements detailed in these Official Rules. The potential Grand Prize winner will be notified by email after the date of the random draw. Except where prohibited, the potential prize winner will be required to provide the Sponsor with valid identification and a valid social insurance number before any prize will be awarded. In addition, the prize winner is required to sign and return a Declaration of Compliance which must be received within ten (10) days of the date notice or attempted notice is sent, in order to claim his/her prize. All potential winners will also be required to correctly answer a skilltesting question to be eligible to receive the prize. If any potential winner cannot be contacted, fails to sign and return the Declaration of Compliance within the required time period (if applicable), or fails to answer the skill-testing question correctly, such potential winner forfeits the prize. In the event that any potential winner is disqualified or forfeits the prize for any reason, an alternate winner will be selected in a random drawing from among all remaining eligible entries. Only three (3) alternate drawings will be held after which the applicable prize will remain unawarded. Prizes will be fulfilled approximately 8-10 weeks after the conclusion of the Promotion. 9. PRIZE(S): TWO GRAND PRIZEs of $1,000 cash each and six SECONDARY PRIZES of 365 forty gram Taste of Nature fruit and nut bars with a total retail value of $726.35 for each secondary prize. The secondary prize will be awarded in assorted flavours as determined by the Sponsor and shipped to the winner's home in one shipment within 30 days of selection of the winners. Any taxes and other incidental charges on the prize are the sole responsibility of the winner. 10. TAXES: Any valuation of the prize stated above is based on available information provided to the Sponsor, and the value of any prize awarded to a winner will be reported for tax purposes as required by law. Winner is solely responsible for reporting and paying any and all applicable taxes related to the prize and paying any expenses associated with any prize(s), which are not specifically provided for in the Official Rules. 11. PUBLICITY: Except where prohibited, participation in the Promotion constitutes winner's consent to Sponsor's use of winner's name, likeness, voice, opinions, biographical information, hometown and province for promotional purposes in any media, without further payment or consideration. 12. GENERAL CONDITIONS: All entries become the property of the Sponsor. Sponsor reserves the right to cancel, suspend and/or modify the Promotion, or any part of it, if any fraud, technical failures or any other factor beyond Sponsor’s reasonable control impairs the integrity or proper functioning of the Promotion, as determined by Sponsor in its sole discretion. In such event, Sponsor reserves the right to award the prizes at random from among the eligible entries received up to the time of the impairment. Sponsor reserves the right, in its sole discretion, to disqualify any individual it finds to be tampering with the entry process or the operation of the Promotion or to be acting in violation of these Official Rules or any other promotion or in an unsportsmanlike or disruptive manner. Any attempt by any person to deliberately undermine the legitimate operation of the Promotion may be a violation of criminal and civil law, and, should such an attempt be made, Sponsor reserves the right to seek damages from any such person to the fullest extent permitted by law. Sponsor’s failure to enforce any term of these Official Rules shall not constitute a waiver of that provision. These Official Rules are subject to change without notice in order to comply with any applicable federal, provincial, territorial and municipal laws or the policy of any other entity having jurisdiction over the Sponsor. 13. RELEASE: By participating in this Promotion, and/or receipt of the prize, the applicable winner agrees to release and hold harmless the Sponsor, the Administrator, and each of their respective subsidiaries, affiliates, suppliers, distributors, advertising/promotion agencies, and prize suppliers, and each of their respective parent companies and each such company’s officers, directors, employees and agents (collectively, the “Released Parties”) from and against any claim or cause of action, including, but not limited to, personal injury, death, or damage to or loss of property, or infringement of any third party intellectual property rights, arising out of participation in the Promotion, or receipt or use or misuse of any prize, or the use of personal information. Winners must sign declaration and release forms, and such other supporting documentation that the Sponsor may request, to give effect to such release. 14. LIMITATIONS OF LIABILITY: Released Parties are not responsible for an entrant's release and hold the Released Parties harmless for: (1) any incorrect or inaccurate information, whether caused by entrant, printing errors or by any of the equipment or programming associated with or utilized in the Promotion; (2) technical failures of any kind, including but not limited to the malfunctioning or interruption of any computer, cable, network, hardware or software; (3) the unavailability or inaccessibility of any transmissions or telephone or Internet service; (4) unauthorized human intervention in any part of the entry process or the Promotion; (5) electronic or human error which may occur in the administration of the Promotion or the processing of entries; (6) late, lost, undeliverable, damaged or stolen mail, or (7) any injury or damage to persons or property, including but not limited to entrant's computer, hardware or software, which injury or damage may be caused, directly or indirectly, in whole or in part, from entrant's participation in, the Promotion or receipt or use or misuse of any prize; ( any liability, including without limitation any claims of infringement, in connection with the Promotion. Sponsor and Administrator are not responsible for any typographical/other error in entries, selection announcement or for any liability for damage to any computer system resulting from participation in accessing or downloading information in connection with this Promotion. If for any reason an entrant's entry is confirmed to have been erroneously deleted, lost, or otherwise destroyed or corrupted, entrant’s sole remedy is another entry in the Prize drawing, provided that if it is not possible to award another entry due to discontinuance of the Promotion, or any part of it, for any reason, Sponsor, in its sole discretion, may elect to hold a random drawing from among all eligible entries received up to the date of discontinuance for any or all of the prizes offered herein. No more than the stated number of prizes will be awarded. In the event that production, technical, seeding, programming or any other reasons cause more than the stated number of prizes as set forth in these Official Rules to be available and/or claimed, Sponsor reserves the right to award only the stated number of prizes by a random drawing among all legitimate, unawarded, eligible prize claims. 15. GOVERNING LAW: Entrant agrees that under no circumstances will entrant be permitted to obtain awards for and entrant hereby waives all rights to claim punitive, incidental and consequential damages and any other damages, and any and all rights to have damages multiplied or otherwise increased. SOME JURISDICTIONS DO NOT ALLOW THE LIMITATIONS OR EXCLUSION OF LIABILITY FOR INCIDENTAL OR CONSEQUENTIAL DAMAGES, SO THE ABOVE MAY NOT APPLY TO YOU. All issues and questions concerning the construction, validity, interpretation and enforceability of these Official Rules, or the rights and obligations of the entrant and Sponsor in connection with the Promotion, shall be governed by, and construed in accordance with, the laws of Province of Ontario and the federal laws of Canada applicable therein, without giving effect to any choice of law or conflict of law rules (whether of the Province of Ontario or any other jurisdiction), which would cause the application of the laws of any jurisdiction other than the Province of Ontario.